​Surf the page and find my research on carbon cycling, the detection of the effects of global change on fluvial basins and their ecosystem services, the management of water quality in reservoirs, and the fate of emerging pollutants at the basin scale. Our new project WATExR has a new webpage and Twitter account. Take a look and join our adventure on extreme events prediction and water quality. 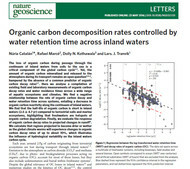 "Organic carbon decomposition rates controlled by water retention time across inland waters"
Look at our last Nature Geoscience paper for the first assessment of the relevance of weathering processes on lake and reservoir CO2 emissions! 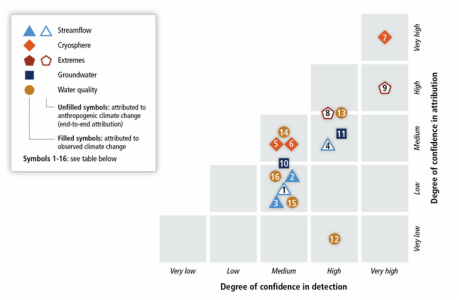 Our paper in Global Change Biology in 2010 (number 13 in the plot) considered as the BEST example of detection and attribution of climate change effects on Water Quality in Freshwater Ecosystems in the last Assessment Report of the IPCC. See Table 3.1 (pag. 235) and Figure 3.2 (pag. 238) in Chapter 3 of the AR5 WGII Report. Look at our last Inland Waters for the first assessment of the relevance of dry river beds on CO2 emissions! Some pictures after a week in Menorca with Dani von Schiller and Biel Obrador measuring carbon emissions from temporary ponds within Biel's project CARBASSES. Lots of fun and emissions! !